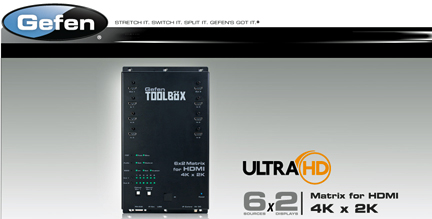 [SatNews] Two new Gefen ToolBox Matrix Switchers for HDMI 4Kx2K help build a 4K infrastructure, just in time for new Ultra HD displays and the increasing availability of UHD content. The 4x4 Matrix for HDMI 4Kx2K routes four sources to any combination of four displays and supports 3DTV pass-through. The 6x2 Matrix for HDMI 4Kx2K routes six sources to two independent displays. Backward compatibility with 1080p full HD resolutions makes both solutions a useful addition to an existing or new HDn system geared for immediate deployment and future Ultra HD compatibility. Gefen Fast Switching Technology significantly improves the lengthy HDCP authentication process. HBR (High Bit Rate) lossless audio formats such as LPCM 7.1, Dolby® TrueHD, and DTS-HD Master Audio™ are delivered with video.